Paediatric cholestasis is a rare but devastating group of diseases that usually manifest in infancy or childhood by impaired bile secretion, due to either primary or secondary alterations affecting the liver secretory machinery, and that may progress to cirrhosis and liver failure. Although there is resemblance in clinical symptoms, the cause of these diseases can be completely different, which is important because it determines, among others, the response to treatment. For a specific subgroup of cholestatic diseases, namely those associated with canalicular transport defects, our pathophysiological understanding has been increased enormously over the last decade. In parallel, treatment options have been developed,1 and the article by Gordo–Gilart et al 2 yet takes another step forward. Scheme of the function of the canalicular ATP-dependent proteins ATP8B1, ABCB11 and ABCB4. A mild deficiency of ATP8B1 will lead to benign recurrent intrahepatic cholestasis type 1 (BRIC-1); severe deficiency to progressive familial intrahepatic cholestasis type 1 (PFIC-1). BRIC-2, respectively PFIC-2, is caused by mild respectively severe ABCB11 deficiency. Deficiency of ABCB4 is associated with PFIC-3 and also with LPAC (low phospholipid associated cholelithiasis). UDCA is also used in ATP8B1 and ABCB11 deficiency, however, without a consistent effect.1 Another compound that is frequently used in these and other cholestatic conditions, rifampicin, indirectly increases the 6α-hydroxylation of bile acids, that can subsequently be glucoronidated and excreted in the urine. Rifampicin might reduce or abolish pruritus in mild ATP8B1 and ABCB11 deficiency (BRIC1 and BRIC2), but not in severe phenotypes (PFIC1 and PFIC2), although current evidence is insufficient to formally substantiate this. Cholestyramine, a resin that binds bile salts in the intestinal lumen, reduces reabsorption of these compounds in the ileum, and could have some effect in BRIC, but not in PFIC. A much stronger effect is seen for biliary diversion, which can dramatically reduce the enterohepatic circulation of bile acids. A recent analysis1 indeed showed that the vast majority of patients with low GGT-associated cholestasis (effectively BRIC and PFIC type 1 and 2, although some rare patients might have mutations in other genes giving low GGT-associated cholestasis) have at least some benefit of this procedure. It seems logical to assume that for these two conditions too a genotype-phenotype-therapeutic effect relationship could be established, using the methods now proposed by Gordo–Gilart et al,2 with mild mutations giving some functioning protein at the canalicular membrane, making those patients good candidates for either supposedly weak (eg, rifampicin) or stronger interventions (eg, biliary diversion). With severe mutations, and no functioning protein, it is reasonable to assume that no bile acid will enter the bile canaliculi, making any of these interventions useless, and rendering the child a candidate for liver transplantation.
. Liver disease associated with canalicular transport defects: current and future therapies. J Hepatol 2010;52:258–71.
. Functional analysis of ABCB4 mutations relates clinical outcomes of Progressive Familial Intrahepatic Cholestasis type 3 to the degree of MDR3 floppase activity. Gut 2015;64:147–55.
. Bile acids: chemistry, physiology, and pathophysiology. World J Gastroenterol 2009;15:804–16.
. Two common PFIC2 mutations are associated with the impaired membrane trafficking of BSEP/ABCB11. Hepatology 2005;41:916–24.
. ABCB11 gene mutations in Chinese children with progressive intrahepatic cholestasis and low gamma glutamyltransferase. 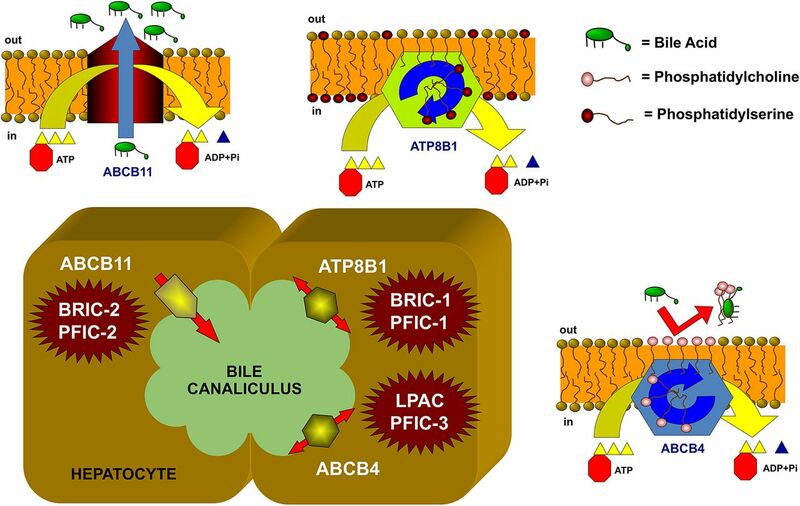 Liver Int 2010;30: 809–15.
. Complementary functions of the flippase ATP8B1 and the floppase ABCB4 in maintaining canalicular membrane integrity. Gastroenterology 2011;141: 1927–37. e1–4.
. Targeting the ABCB4 gene to control cholesterol homeostasis. Expert Opin Ther Targets 2011;15:1173–82.
. Spontaneous cholecysto- and hepatolithiasis in Mdr2-/- mice: a model for low phospholipid-associated cholelithiasis. Hepatology 2004;39:117–28.
. Clinical features and genotype-phenotype correlations in children with progressive familial intrahepatic cholestasis type 3 related to ABCB4 mutations. J Pediatr Gastroenterol Nutr 2011;52:73–83.
. The wide spectrum of multidrug resistance 3 deficiency: from neonatal cholestasis to cirrhosis of adulthood. Gastroenterology 2001;120:1448–58. Contributors Both coauthors contributed equally to the preparation of this commentary.